Online marketplace eBay launches its restoration Car Challenge for the second year running. Following its successful inauguration in 2016, the eBay Car Challenge makes its return this month with three new restorers. The challenge sees old, run down vehicles being brought back to their former glory. In the mix for 2017 are a 1967 Alfa Romeo Duetto, a 1974 Volkswagen Camper Van, and a 1964 Series 2a Land Rover. 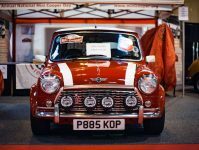 The lucky restorers of the Car Challenge are granted a budget of £4,000 and a scale of three months to purchase parts and accessories from the online marketplace. Whittled down from nearly two thousand applicants, this year’s trio of triumphant restorers have now been announced. 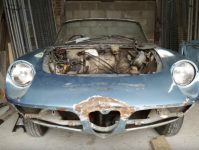 Gripped by a love of rare cars as a child, Alex Morris proved a successful applicant for eBay’s restoration challenge with his 1967 Alfa Romeo Duetto. A novice to restoration, the Alfa is Alex’s first full scale project. And he’s certainly taken on a challenge. The Alfa needs a full engine repair, new upholstery, a nose replacement and a full strip and repaint, for a start. But Alex seems undeterred by his long list of repairs and restorations, describing his project as his ‘baptism of fire’. Carl Pickard also proved worthy of eBay’s generous £4,000 budget. By merging the traditional and the modern, Carl plans to bring his 1974 VW Camper Van bang up to date. Carl plans to make the Camper into a trendy two-seater. The dated classic will get a new lease of life with the help of a Subaru engine, new wiring, and a speaker system that packs a punch. The conversion of ‘Daisy D’ will take place in a converted parking lot in Southampton. The final restoration project funded by eBay comes from Dan Goude. 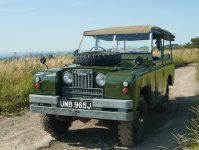 Dan is tackling an ex-military 1964 Series 2a Land Rover named ‘Bertha’. As his first car, poor Bertha sat unused and unloved for over 20 years in Dan’s garage. For many of us, our first car is always our first love. Fortunately, eBay’s Car Challenge has given him the opportunity to put some much needed TLC back into his old sweetheart. Planning to replace the Land Rover’s bumper and cross member with military originals, Bertha can finally relive her glory days. With a generous budget and a three month time scale, these three run down relics will become modern masterpieces in no time. eBay will be keeping tabs on the revamps, and you check out the eBay Car Challenge website to follow the restoration projects and videos.